There are many strange professions in the world, especially among the practitioners of arcane magic. This is mostly due to the fact that the majority of people do not have the acuteness of perception to understand the arcane arts, and also because many magicians are considered nuisances or pariahs in their respective society. This is true of the Crescent Occultist, a whimsical spellcaster whose intuitive awareness of the arcane forces of the earth and their connection with the souls of its creatures give him unique abilities that are beyond the comprehension of even the most knowledgeable sages. 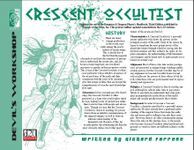 This four page Crescent Occultist Prestige Class PDF is an easy-to-integrate PC class and just the sort of thing needed for DMs to add depth to any great d20 fantasy campaign world and gaming session.